In 2014 Justin Skeesuck and Patrick Gray set out on an adventure like no other. How this came about is one of the main reasons we supported this worthy cause. Justin is required to use a motorised wheelchair following a terrible car accident when he was 16 and the onset of a debilitating neuromuscular disease. Now Justin dedicates his life to supporting others and inspiring people with disabilities to keep living their lives to the full. When he came up with the idea to do the 800km full trail of the Camino Frances his life-long friend Patrick agreed to join him and push him all the way to Santiago. 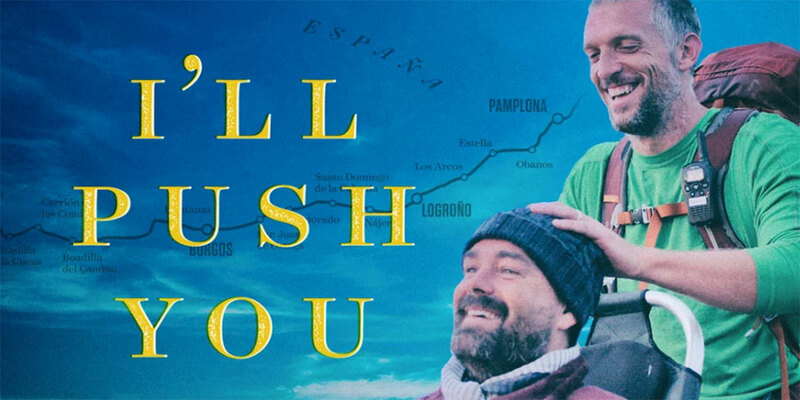 In 2017, Justin and Patrick released I’ll Push You, a book and a movie documenting their incredible Camino journey and inspiring friendship. We were absolutely thrilled to screen I’ll Push You as part of our St James Day celebrations in 2017, and have Justin and Patrick join us via Skype. We were inspired by their commitment to support each other, their wonderful friendship and a selfless attitude. Justin and Patrick took on all of the physical and mental hardships along the 800km trek to Santiago de Compostela in Northern Spain. After a whole month on the trail, they crossed the finish line embracing friends, family and fellow pilgrims who had helped them and were inspired by them along the way. And one day ahead of schedule! I’ll Push You: the adventure begins. I’ll Push You: mountains and valleys. I’ll Push You: familiar faces. I’ll Push You: something to learn. I’ll Push You: crossing the finish line but far from over.